Delta-homes is a browser hijacker that is usually distributed via third party websites. 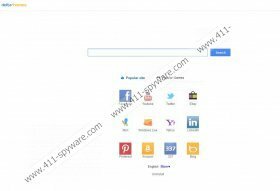 This browser hijacker modifies your browser settings without your consent and then tries to expose you to associated websites in order to increase their traffic or for other marketing purposes. Although Delta-homes is not an extremely dangerous computer infection, you must remove it from your computer as soon as possible, because the longer it remains in your PC, the more damage it may cause (involuntarily). For those users who encounter computer infections often Delta-homes may seem to be familiar. That is so, because it is directly related to such browser hijackers as PortaldoSites or Qvo6 Virus. All of these browser hijackers are created by the same cyber criminals and they all arrive at your system with the same goal in mind – financial revenue. Unlike rogue antispyware applications Delta-homes does not intend to steal your credit card information or track your banking logins and passwords via keylogging. Nevertheless, it may collect data on your web browsing habits via cookies, and later on this data might be used to generate pop-up ads that display content similar to what you search online for. Keeping in mind, that third parties might easily hijack Delta-homes, the pop-up ads that are displayed to you might as well contain external links that redirect you to corrupted websites related to malware. Finally, there is one more infection symptom that is not as dangerous as excruciatingly annoying. Delta-homes changes your home page and default search engine settings. The worst is that this happens right under your nose – users often download the browser hijacker without even realizing it. Delta-homes generally arrives along with freeware programs that are available for download at third party websites, so when and if you download and install them, if you are not attentive during the installation, Delta-homes slithers into your system as well. Nevertheless, it is always possible to terminate this infection. The sooner you do it, the better, because this way you will prevent dangerous computer threats from entering your PC. Refer to the instructions below in order to restore your browser settings manually. Delete all the other text from the line. Click OK. Select Delete personal settings and press Reset again. Wait for reset to be complete and click Close. Press Reset Firefox again and then press Finish. Press Manage search engines under Search. Set a new search provider, delete Delta-homes and click Done. Manual removal may not be enough to delete all the malicious files from your computer. Run a full system scan with SpyHunter free scanner and then acquire a powerful computer security tool that will help you terminate remaining malicious programs and files.